As a kid growing up in Madison, I played hockey at the park, and went to Badger games when I could. I didn't play youth hockey. When I moved back to Madison, I started playing with the Computer Science Department hockey club at the university (where I work). For many years I was the club organizer and team captain. I had been following Gay Hockey for many years, but never had the wherewithal to organize a team. When I heard about the MGHA, I told Patrick I'd be glad to help. Since the first MGHA season I’ve been on the Board, served as team captain, served on hockey ops, tournament director, worked on the website, helped with clinics, and played a lot of hockey. I have played in several Gay Hockey tournaments in addition the MGHA Classinc: NY Chelsea Challenge almost every year, Chicago, Boston, and the Gay Games in Cleveland. This year I promised to play in the Play LA tournament (Labor Day weekend), and next summer in Vancouver I hope to make it Toronto too. 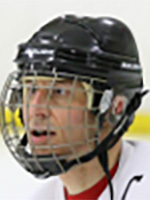 I started reffing hockey in 2009 (I should have started sooner!). If you have any rules questions, just ask! If you want to really learn hockey, be a ref!